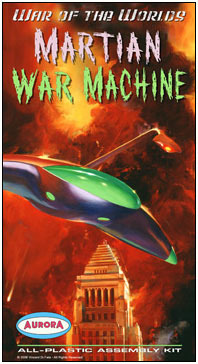 Martian War Machine from War of the Worlds - Aurora Fantasy Box. This is a full size 13 X 7 X 2 Aurora Fantasy Box by artist Vincent DiFate. The image is created to appear as though Aurora had made all the kits that we as kids of the 1960's and 70's could have ever imagined.